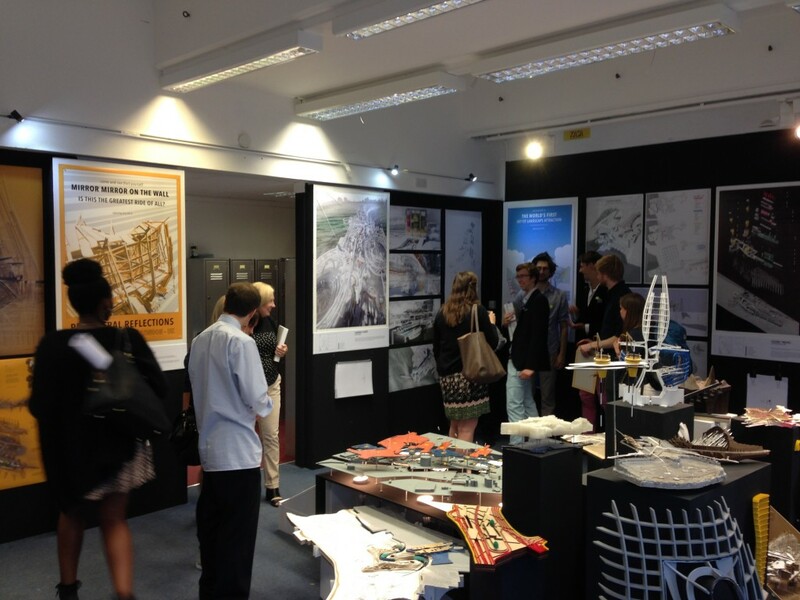 On the Friday 19th of June 2015 at 5:30pm, the Kent School of Architecture hosted its 10th End of Year Exhibition. The show comprised work of all 5 years as well as additional work from foundation and postgraduate years. 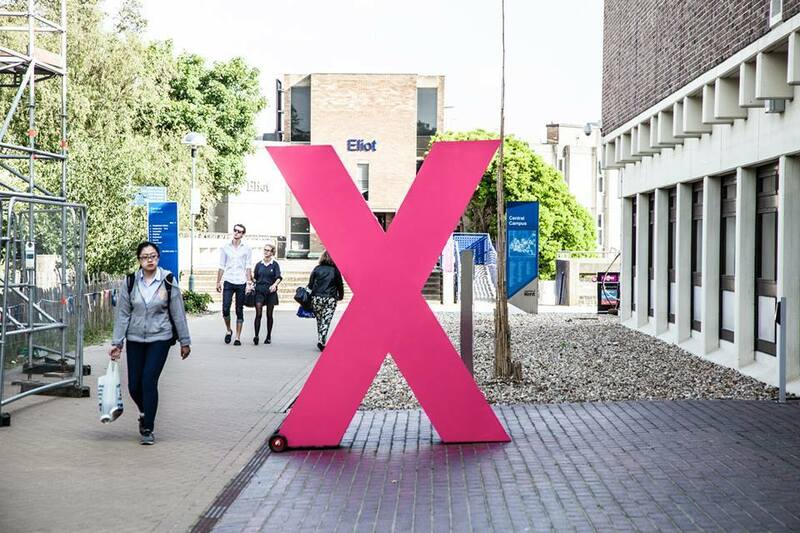 The Marlowe building on the University of Kent campus (marked using an enormous pink X to symbolise the number 10) was unsurprisingly bursting at the seams with high quality work and scores of people who had travelled to see it. The exhibition was officially opened by special guest and Architects Journal Editor Rory Olcayto who spoke shortly about the need for high quality schools of architecture and about the nature of architectural education itself. 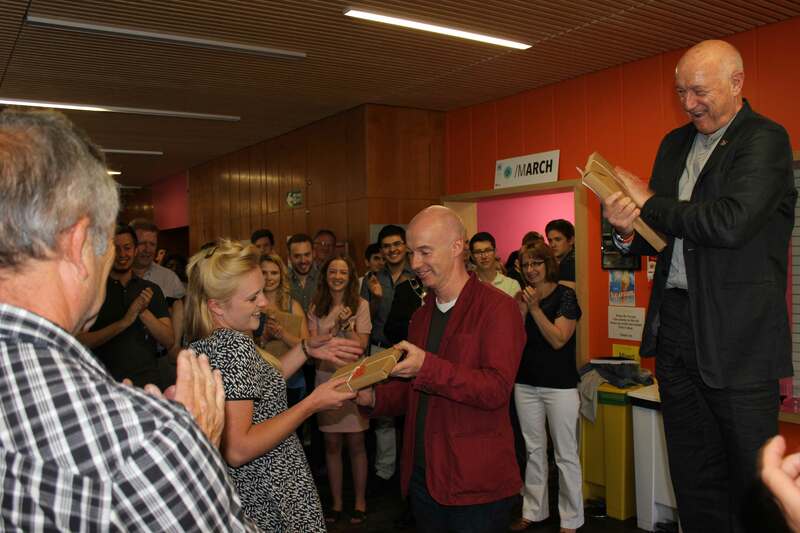 The evening then progressed to the presentation of prizes including the Eliot Cloister design competition winners prize for Prinka Anandawardhani and Tracy Hulley, presented by Eliot College Master Stephen Burke. 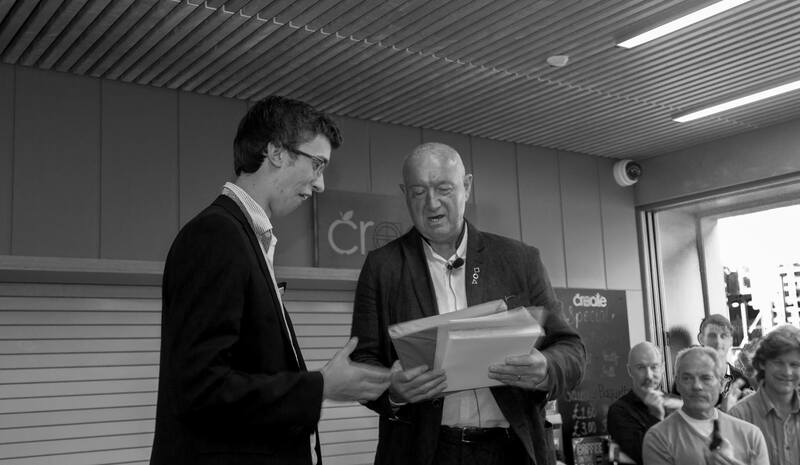 There were many other prizes awarded by the school and also sponsors including an award from Guy Holloway for Stage 2’s module Form and Structure. Guests who were in attendance commented on the richness and quality of the work on show, and their delight at how quickly the young school is progressing. Also on show were the schools latest technological advancements including 3D printers, scanners and a drone in the foyer. 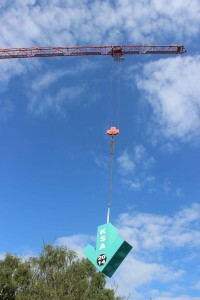 The Kent School of Architecture is in a constant state of progression, in both reputation and therefore quality of work, which means that future end of year exhibitions will continue to rise in quality. We look forward to seeing you all there next year! Just before the exam I took a trip to the beach with a couple of friends for an afternoon of revision, tea, oysters and eventually dinner. 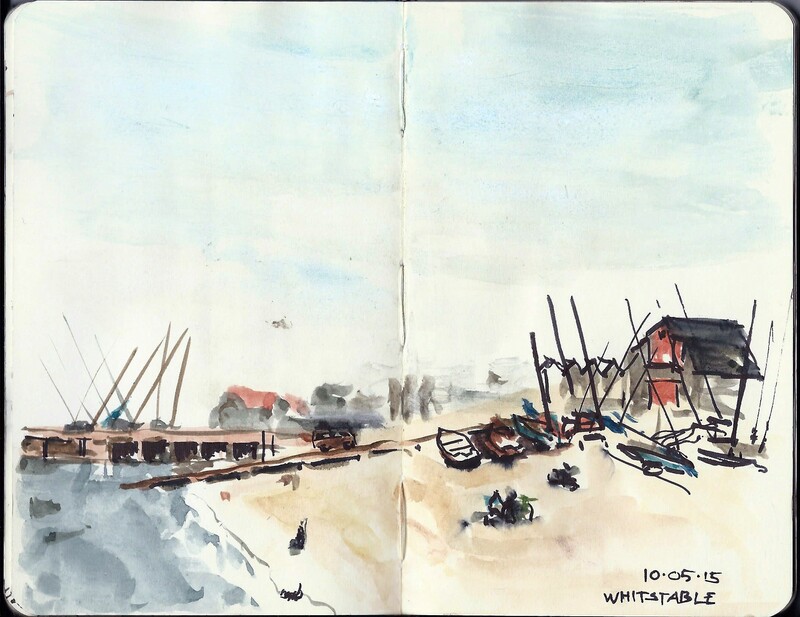 Whitstable turned out to be a great venue for reading, although if you are planning on doing this yourself, do remember to bring paperweights with you. The beach can get pretty windy and wet notes aren’t quite as informative as dry ones. After the stress of the Nineteenth Century Architecture exam and the final structural report hand in passed, I found myself with plenty of free time to start enjoying life again. So I picked up my sketchbook and my favourite watercolour set and have been busy. Well, not that busy. Yesterday whilst waiting for the clock to strike seven, I got bored and decided to go for a stroll around the city centre. I have to admit it wasn’t the best day for a walk, hence I only ended up with this fairly quick sketch. The line work is particularly rushed as by the time I decided to put pen to paper, I was already late for dinner. This is one of my favourite spot in Canterbury, the cobbled narrow street and shop signs frame Bell Harry perfectly. 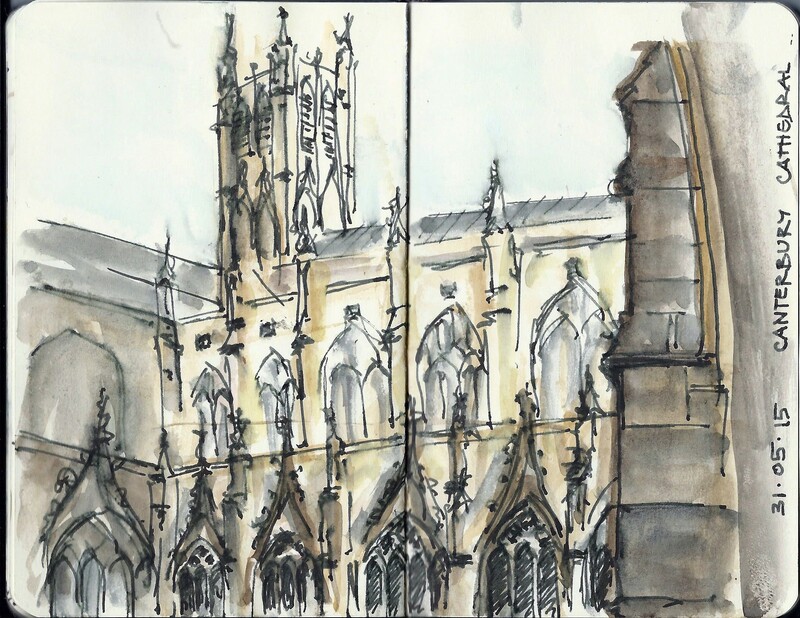 I have been drawing the cathedral a lot recently. Just a few days ago, fellow aspiring architect, Prinka Anandawardhani and I took an impromptu visit to the cloisters and spent half an hour sketching. Hers is a little better than mine so I chose to omit a scan of it to avoid competition. 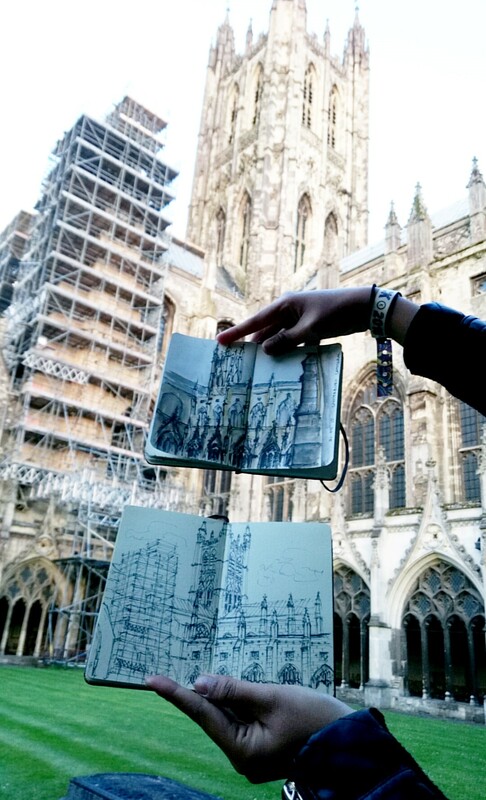 The restoration process for the cathedral is forever on going, the result of the successful “Save Canterbury Cathedral” Appeal launched in 2006. Though it is a shame that in order to save it, parts of the building and its surrounding complex has to be covered up. It was slightly frustrating that when my friends came for a day visit, Christ Church Gate was concealed behind scaffoldings and tatty white fabric. Well guys, if you’re reading this, here it is. Through my eyes. For more accurate representations go to google images. Finally, to end this ramble. 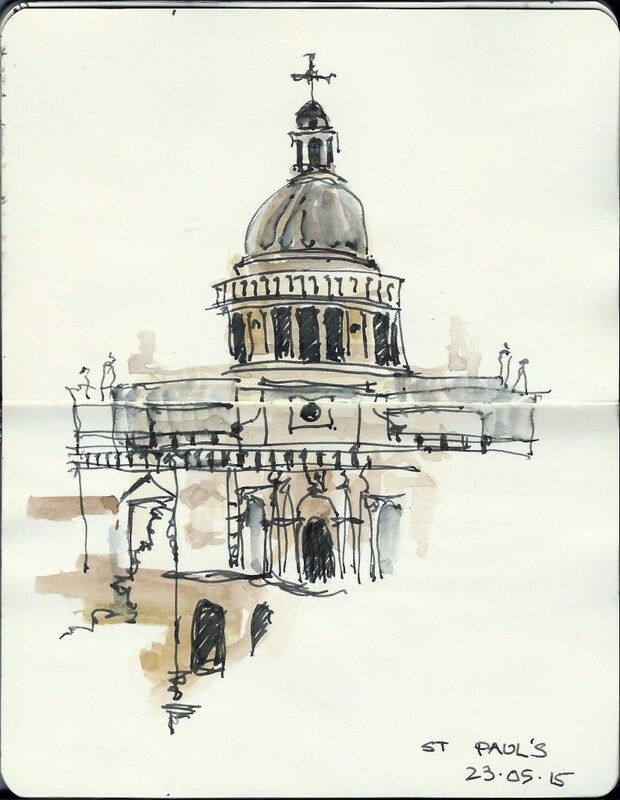 My favourite sketch at the moment, this one of St Paul’s Cathedral from the 1 New Change rooftop, right by St Paul’s station. 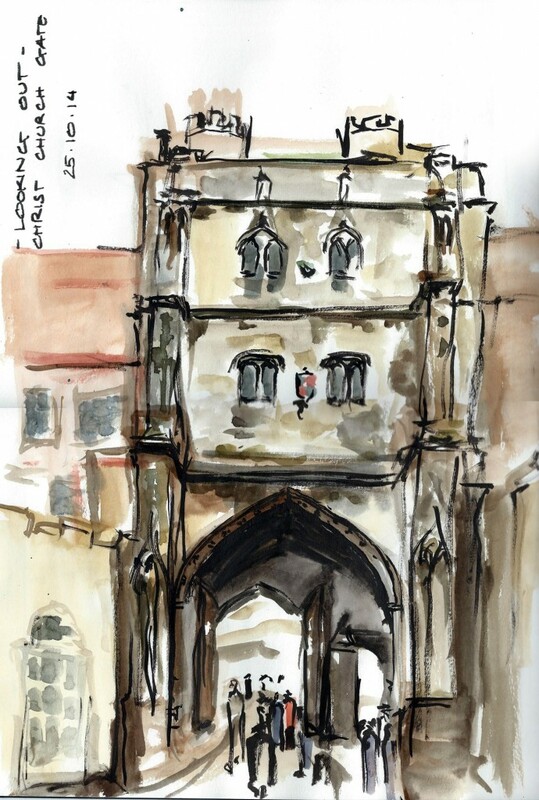 I would seriously recommend going there for a great view of London and a day out sketching. Instead of spending my Easter holidays relaxing on a beach in South Devon with a cream tea at my side, I used this time as an opportunity to undertake some work experience with an architectural firm who specialise in the design of tourist attractions. Although at first reluctant to give up the only free time I had after a very busy term, I soon came to realise the benefits of my decision. 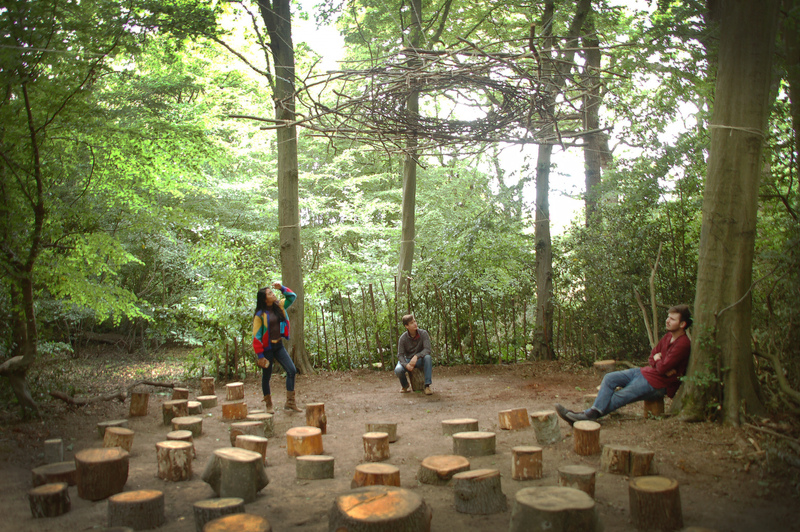 University learning is a vital part of the process to becoming a good architect, but it has its limitations, the first being the disconnection between students and active building projects. This means that while learning at university you may think that what you are doing is worthwhile, but it is not until you enter the industry that you realise what the most important processes are and therefore which skill areas are most worthwhile to develop. It’s like trying to paint someone’s portrait before ever seeing them. If it were up to me to decide, I believe that a degree in architecture should start with compulsory work in practice before theoretical learning begins, this however for obvious reasons is not the case in our current system. Now having spend time studying the profession I am in a better position to judge which skills are require and which are less so. This also means that I can now relate the projects I undertake at university to the real world subsequently giving my university work more depth and realism. Another benefit to getting into the industry early is what is known as getting your ‘foot in the door.’ It is basic business that dictates it is more cost effective to keep an employee on than to train a new one, therefore as soon as you begin to learn company specific processes, you are making yourself very attractive when it comes to longer term planning. What I mean by this is that by getting into a firm early, knowingly or not, you are making the search for a year out position much easier when it comes to that time. While others are having the last minute panic as third year comes to an end, you can relax knowing that yours is already sorted. Although I have not developed my design skills very much, I believe that I have learnt more about the processes involved in the architectural profession in those 3 weeks than I have done this year at university, and I would encourage everyone to do the same. In its 9th year of running, Kent School of Architecture has gone from strength to strength through its dedication and hard work of both staff and students. The End of Year Show 2014 certainly was a spectacular culmination of the projects the students had been working on during the academic year, leaving staff humble with pride after the amount of support they had been giving the students throughout the year. And what better way to make a statement than the BFA (‘Big Friendly Arrow’) hanging from one of the cranes originally being used during the current construction of the Templeman Library extension! Anyone else around campus who would approach the arrow outside the Marlowe Building would definitely then brace themselves for an exhibition that opens its doors with brimming confidence and finesse. An initial thank you must be extended to the workshop team, Kevin Smith and Colin Cresser, and any volunteers who helped assemble the BFA. It should also be noted that Kevin and Colin had worked tirelessly to put together many of the plinths and other woodwork that made up a lot of the exhibition layouts. The students are certainly grateful for their contribution. The Undergraduate exhibition (Stage 1 in part of Studio C downstairs, Stage 2 in the Marlowe Foyer & Stage 3 in the Digitial Crit Space upstairs) was an impressive display of students starting out their journey in architecture and a pleasing reflection on what they had achieved so far, in terms of acquiring new skills and taking on challenging projects. 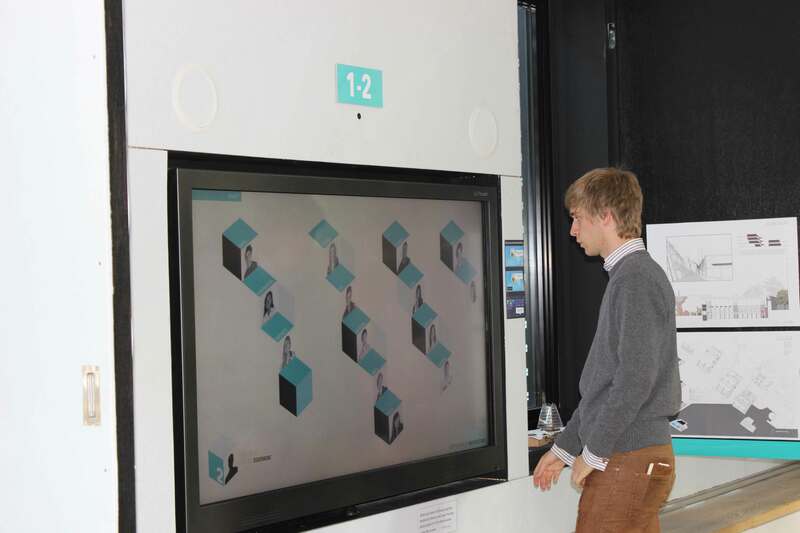 The Stage 3 projects included Modular (Canterbury student accommodation masterplans) and Urban (School of Arts building proposals based in Rochester). 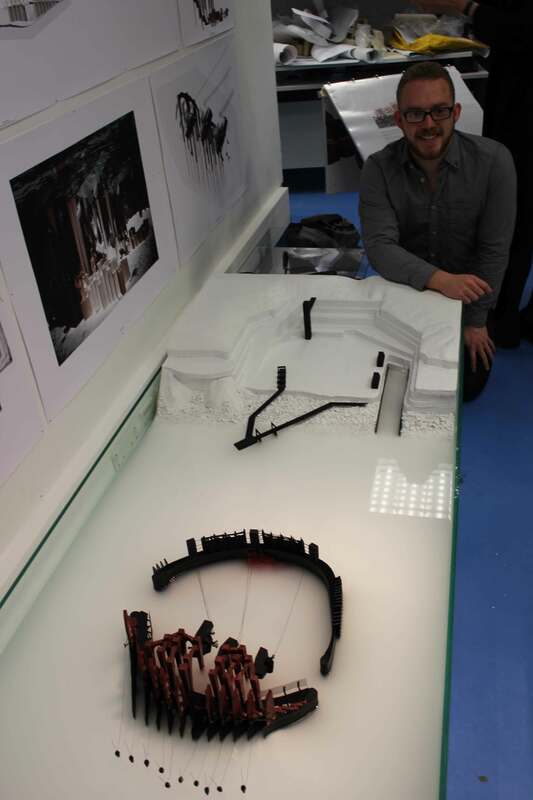 The combination of physical models, drawings and utilisation of 3D BIM software was a perfect example of how the students were making the most of the development of their projects and help prepare their first professional architectural portfolios. The MArch exhibition was held in Studio C downstairs and immediately paved the setting for a unit system that created sheer diversity via the range of projects. Unit 1 (led by Michael Richards & Michael Holms Coats) looked at ‘Cinque Ports’: the coastal cities of Kent and it was this space where visitors were greeted by a sea (no pun intended) of delicate, intricate models in the middle of the space, to show these students had thought carefully about how they physically built up their schemes. Unit 2 (led by Ed Holloway & Peter Ayres) looked at the Isle of Portland and the importance of Portland stone. It was interesting to see how the students could take one material and use it to tell a story within their schemes. Unit 3 (led by Corinna Dean & Diana Cochrane) looked at the urban infrastructure and cultural language of Istanbul, Turkey. There was a real burst of culture in the space with a video showreel of observations in Istanbul, as well as a lot of rapid documentation on how the schemes could help the Turkish community. Finally, Unit 4 (led by Shaun Murray & Yorgos Liozos) looked at Canvey Island near Leigh-on-Sea, before designing pioneering villages that reformulate environmental issues. The technical approaches by the students were so bold and complex, very large areas of landscape and topography were shaped and reformed too. Kent School of Architecture are privileged and grateful for everyone who has been involved with arranging the exhibition; all students who selected work and curated the spaces, as well as academic, administration and workshop staff who all provided exceptional help to the students during the course of the year and leading up to the end of term. The success of the exhibition and the beautifully put together catalogue would not all have been possible without the main co-ordinators, Stage 5 students Rosie Seaman and Peter Evans. Many thanks to the committee and helpers who assisted Rosie and Peter with all the arrangements. 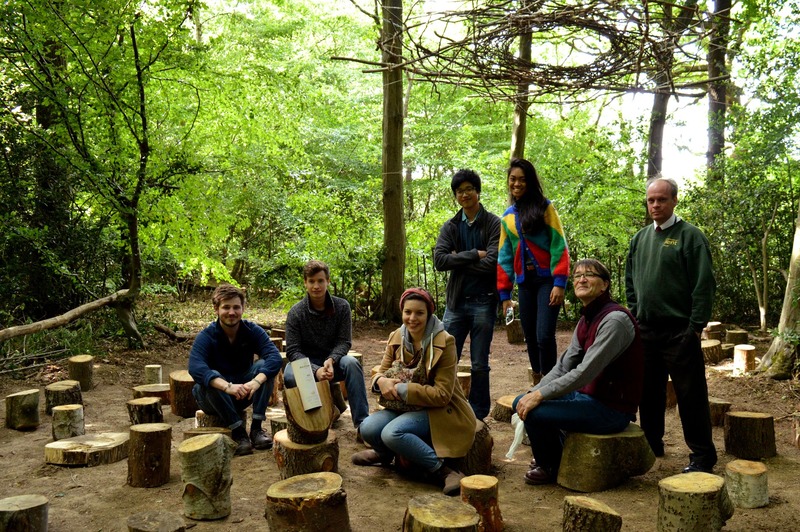 Until next academic year, we wish everyone a wonderful summer and we look forward to our upcoming 10th Year Anniversary, as well as the University of Kent’s 50th Anniversary in 2015. 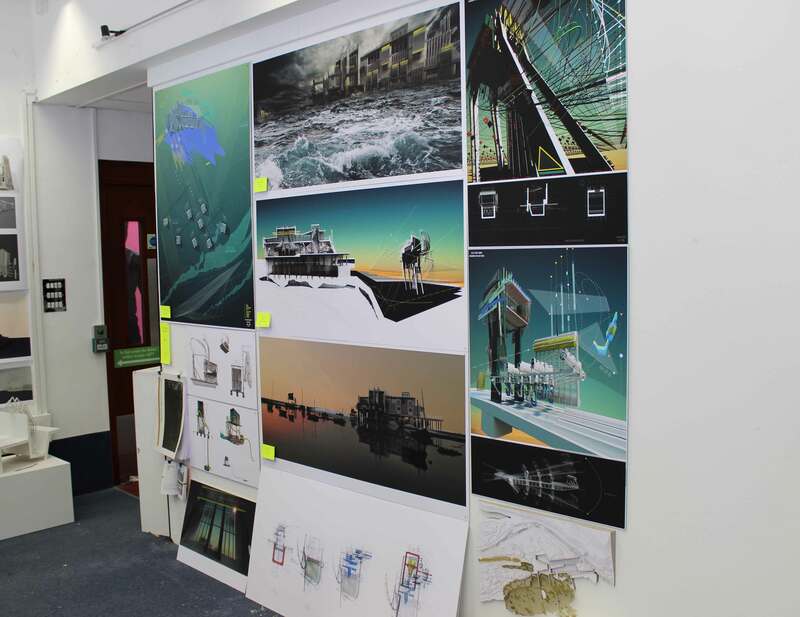 Today marked the final university design crit the 5th Year MArch students had to face, before the professional stretch in the real world towards their careers in the architectural field. It does seem like pressure, but for many of the 5th Years, it was clear that they just wanted to end the course on a pleasant high and give it their best shot. The result of the work sprawled across Studio C downstairs in the Marlowe Building was clear: dedication, commitment and flawless effort had been put in. What stood out the most was the range of mixed media and vast construction approaches. From charcoal drawings and simple, rendered CAD to Photoshopped renders and structural models, the 5th Years had proved that they weren’t afraid to experiment and push the boundaries of design. Some introductory speeches were in more depth than usual, due to making sure that the thorough knowledge and finest technical detail that went into the process of the schemes were explained to the curious panellists. 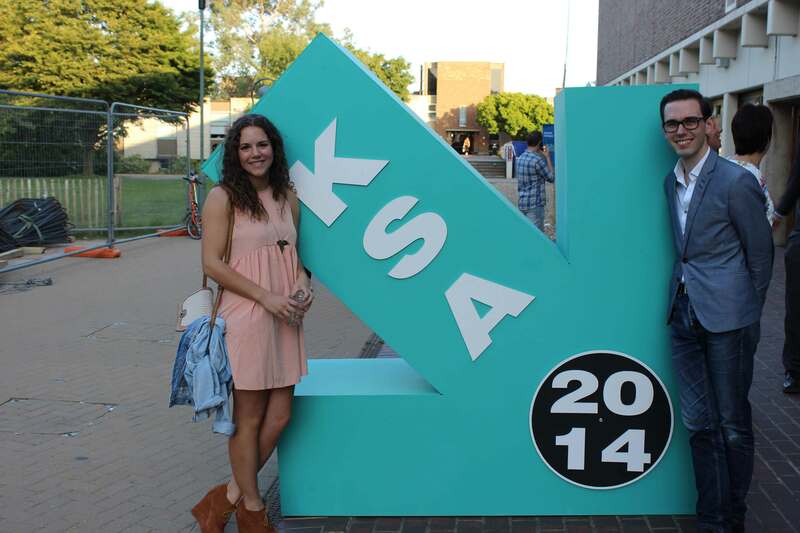 It was all an example to be set for the 4th Years, who are expected to step into their shoes next academic year. 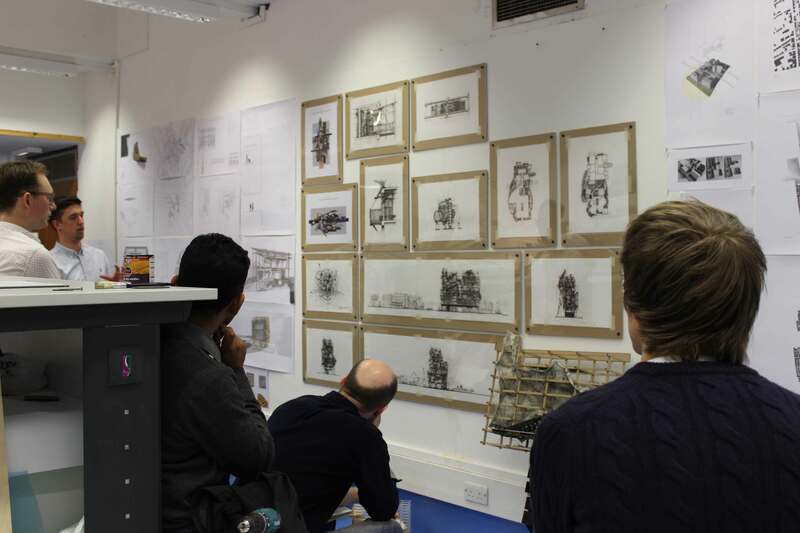 While technical and structural requirements were crucial, the message that the MArch course gave after today is that students do have the opportunity to really express themselves and find out what personally interests them in architecture. The standard of work reflected, in some ways, personality and working methods that students each find most comfortable. Moreover, fantastic material for portfolios that the MArchers can show off to potential firms when looking for employment. Many congratulations to the finalists and have a well-deserved rest! 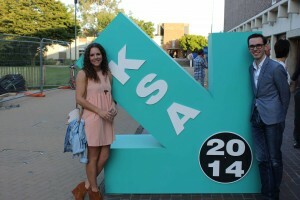 Details of the upcoming KSA End of Year Show will be announced within the next couple of weeks.